Anyone who welcomes a prophet because he is a prophet will have a prophet’s reward; and anyone who welcomes an upright person because he is upright will have the reward of an upright person. If anyone gives so much as a cup of cold water to one of these little ones because he is a disciple, then in all truth I tell you, he will most certainly not go without his reward. We think of prophets as people who hear God’s word easily and who are dedicated to speaking God’s word no matter how it threatens their lives or livelihood. We see prophets as living in ancient times to lead God’s faithful through troubling times. If this is our thinking we miss Matthew’s message to us today . . . for prophets dwell and work and play among us today, sharing God’s word with us, urging us to stay close to God. Yet how many prophets speak to us each day and we ignore them? How many of us are prophets and fear speaking out the words God asks us to speak? We think of upright people as those who have a strong moral compass, as those ethical, decent few who remain in God’s Way despite all the temptations and lures that might draw them away from following God closely. We see upright people as that small percentage of somber and serious faithful who eschew fun because it threatens their serenity. If this is our thinking we miss Matthew’s message to us today . . . for the upright live and labor and enjoy human company as much as the divine. Yet how many upright people do we avoid as too pious or too starry-eyed? How many of us avoid showing our uprightness and fear sharing our thoughts about God because we do not want to be perceived as odd or strangely different? We think of disciples as people who follow God so closely that they rely on God for every decision they make despite the tug of social, political or religious influences. We see disciples as those marked with a special sign or those given special courage or graced with exceptional perseverance. We somehow believe that they are scarce in any given group of people and that they were born with unique perception and power. If this is our thinking we miss Matthew’s message to us today . . . for disciples walk and talk and comingle with us each day all day. How many of us avoid God’s disciples because they seem a bit off and are not influenced by sports figures, by politicians or church leaders? How many of us are clearly disciples but are leery of identifying ourselves as one who follows Christ? 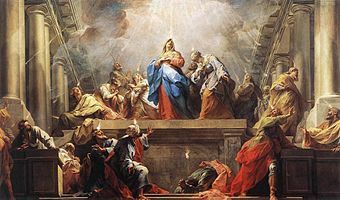 Today Matthew tells us that the miracle of Pentecost is timeless, that its power is endless, and that its space is unlimited. Today Matthew invites us to be those upright, prophetic disciples whom Christ has called. Today Matthew urges us to be our best selves. Today Matthew calls us to be one with Christ . . . to be divine. And so we pray . . .
Dear God: We hear your voice and yet for some reason we falter; give us the courage and strength to look nowhere but at you. Dear Jesus: We know your command to put our feet in your footsteps and yet somehow we stumble; give us the fortitude and fidelity to never give up to any threat and never give in to any voice that calls us away from you. Dear Spirit: We gather ourselves to step forward in acceptance of your gift of discipleship. On this Pentecost Sunday when we rejoice in your in-dwelling, remind us of the holy privilege we share with your upright prophets and disciples as we follow Christ, and shelter in your presence. Bless and keep us always as we celebrate with you and all your holy ones. Amen.